Y’all know I love me some shoes and when I first found out about ShoeDazzle.com I was so excited at the prospect of joining a kind of shoe of the month club. Especially one sponsored by Kim Kardashian, who always looks glam. The idea behind ShoeDazzle is that each month a shoe stylist chooses five pairs of shoes for you based on a style survey you take. Of the five pairs that you are shown you can choose one pair and the monthly cost is $39.95. Sounds good, eh? I have to admit that after a year of being a ShoeDazzle member I have yet to actually purchase a pair of shoes. The problem is that the shoes my “stylist” chose for me are more suited for someone who takes their clothes off for a living, stars on a reality show, or models for Victoria’s Secret. I don’t want you to get the wrong idea about me. I’m not a shoe prude. I have a fair amount of stilettos, prints, loud colored shoes neatly (ha ha, Travis, shut up) arranged at home. I’m not afraid of a little heel even though I’m 5’8″. But I live in Reno, Nevada. Not exactly a booming mecca of fashionistas like Kardashian’s hood. We have inclement weather, a handful of nightclubs that cater to the fake ID, Jersey-shore crowd and no reality shows filming as far as I know. I work at a place where I am one of four women so looking as non-whorey as possible is really important. Not that it’s ever really okay to look whorey. Except on Halloween because duh. I want you to know that none of these shoes are from ShoeDazzle.com because I am trying to respect their terms and conditions. Instead I chose shoes that represent the types that I have been offered. At this point I’m not sure I will ever purchase a pair, which is sad for a shoe enthusiast like me. Don’t worry Trav – they were 50% off. The purse and wallet were about $13 bucks each. 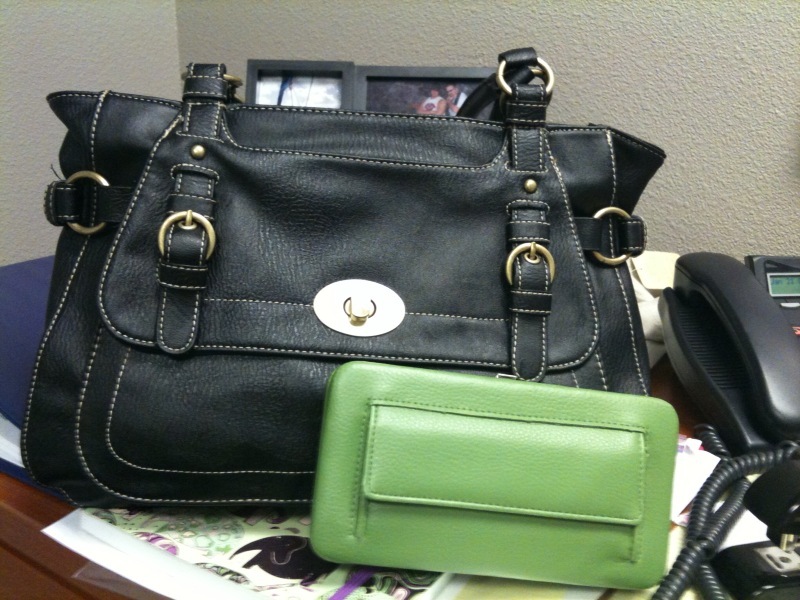 I know it’s a girl thing, but having a new purse always makes me feel good. It forces me to clean out the old purse; purging the club cards, receipts, and random pieces of paper that collect over time. This was just the treat I needed to lift my spirits. Happy Thursday! More to come next week – Wedding Business, a new eating plan, and of course more complete randomness from my completely random life!